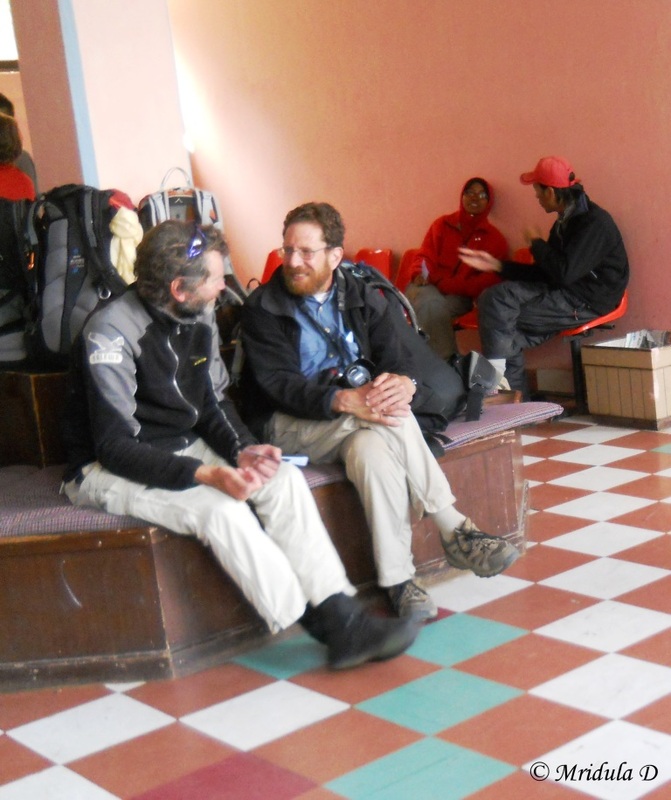 What do you do when you have trekked to Everest Base Camp and have finished writing about it? You get Low altitude sickness! And you want to throw tantrums. But on the brighter side I can still write about my Lukla-Kathmandu Flight. 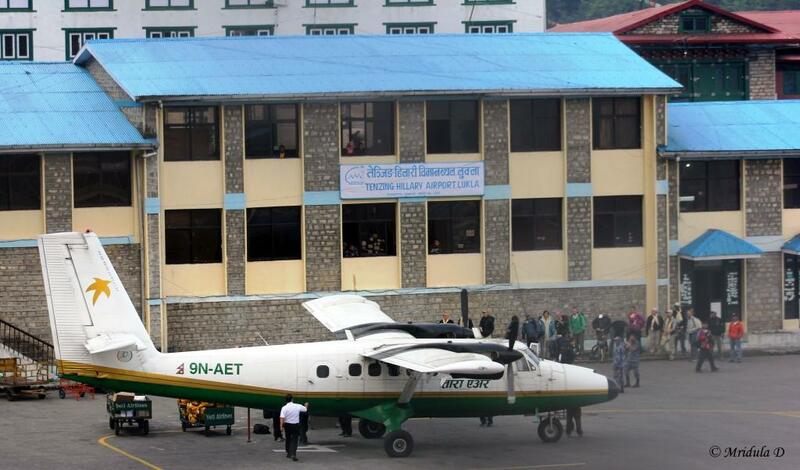 The Tenzing-Hillary Airport is probably one of the scariest in the world. This is a Tara Air Plane and I asked someone if it was a new airline? He replied, “It was known as Yeti Air and they crashed a lot of planes. So they renamed themselves.” I also took a Tara Air flight, no wonder the candies still said Yeti Air. 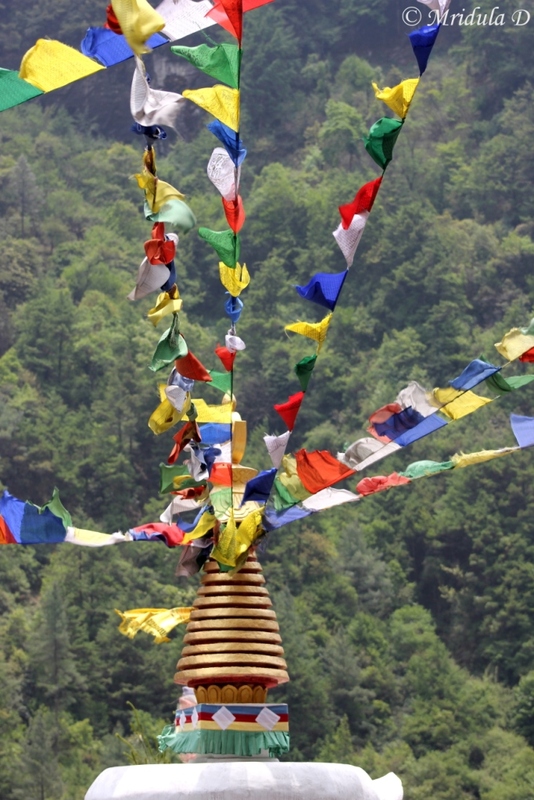 If the weather goes bad the flights in and out of Lukla get cancelled. At the end of a trek you don’t want that to happen. 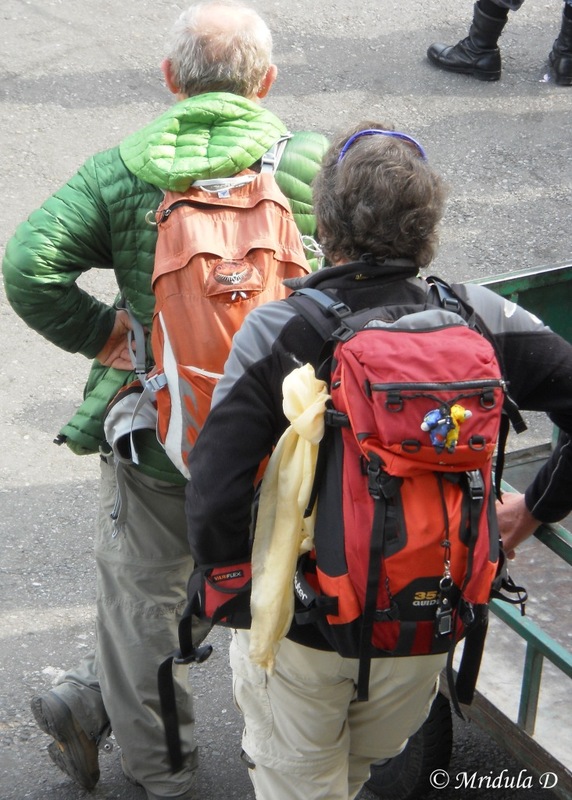 While we were waiting for the plane I saw the Everest climbers from Pheriche once again. It was the gentleman on the left who had said at Pheriche that even though he had climbed Everest it was not a happy day because his friend died. At the Nest also someone pointed out an extremely thin gentleman and said in hushed tone, “He successfully climbed the Mount Everest.” The person was so unassuming that if it was not pointed out to me I could have never guessed. This time I knew if I would get close to the cockpit I could take pictures. 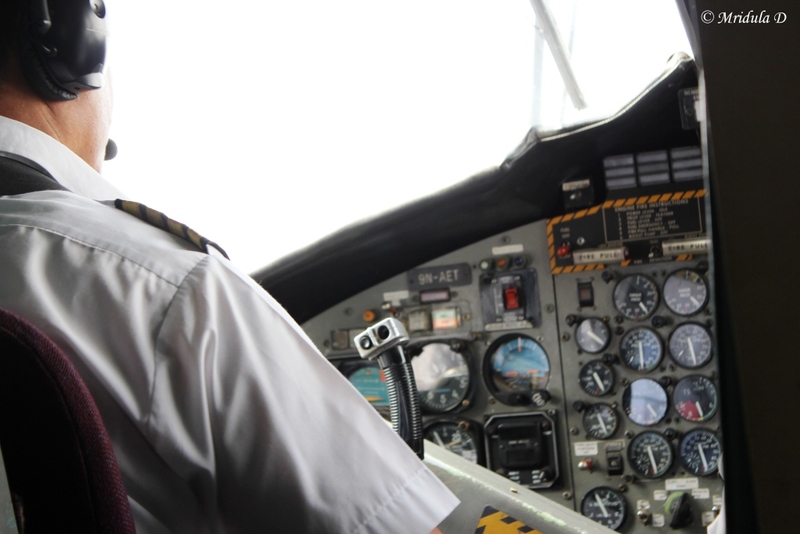 This was the co-pilot with his set of gadgets to look after! 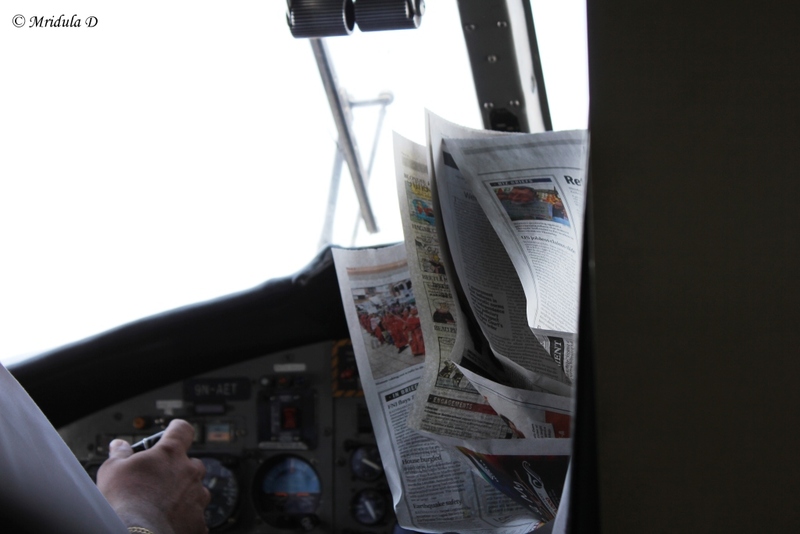 And at one point the pilot took out a newspaper! I have to say it was quite a site but soon after we landed at Kathmandu safe and sound. And I will leave you with this video of a landing and take off from Lukla’s Tenzing-Hillary Airport. I had told Deepak the last night that I would not get up early as it hardly made any difference to when we would reach Lukla. Namche Bazaar to Luka was also two days worth of going up which we were descending in one day. But as I went to sleep at 8.00 pm in the evening I was up once again by 5.30 am and we were heading out after breakfast at 7.30 am. I ate roti (flat Indian bread) with Omelet without any difficulty. 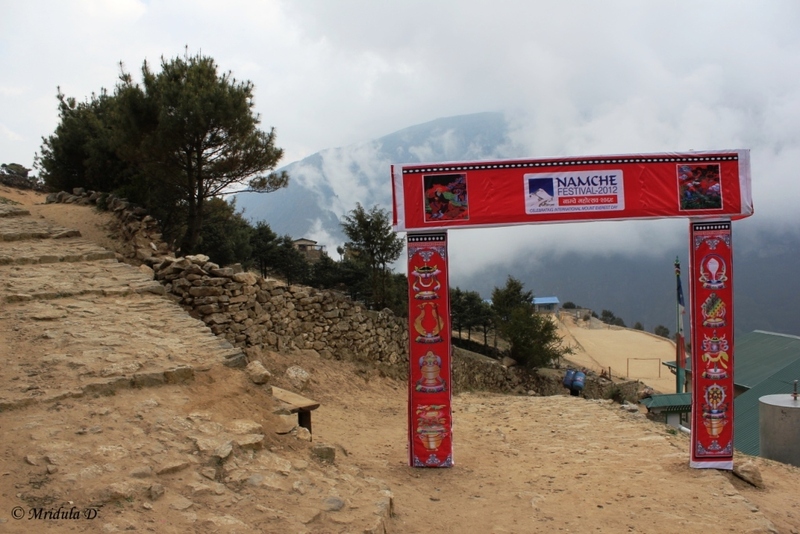 Namche Bazaar was about to host a festival in a few days time and it was gearing up for it. As there was a festival when we were going down a lot of people were walking up to Namche either to participate in the festival or carrying supplies for the festival. So there was a bit of a merry crowd on the way. 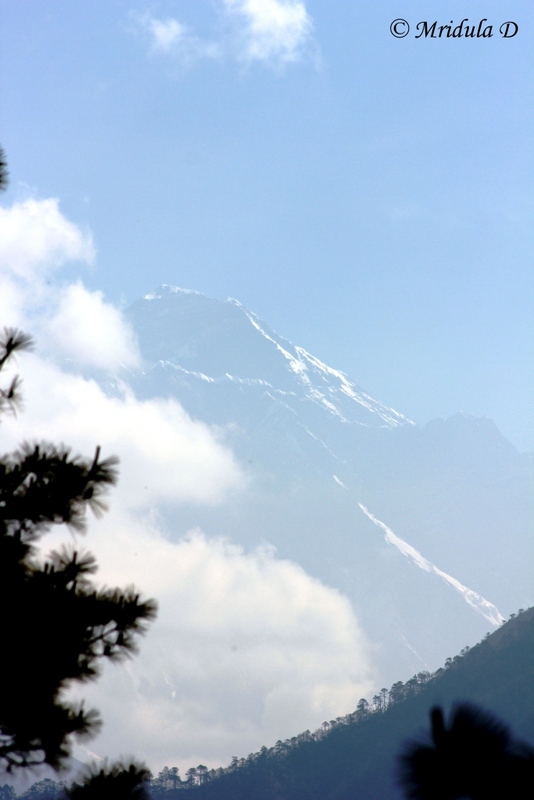 Soon we reached a point where Deepak said this was the last view of Everest. The sun was shining brightly over the view but I had to click a picture and share it as well. While coming up we had not seen this as there were clouds. I met the South African group once again. They were getting a certificate made at a check post that they completed the Everest Base Camp Trek. I decided to give that a miss. Also they reminded me, “If we meet so often, rumors will fly!” I once again laughed at it. 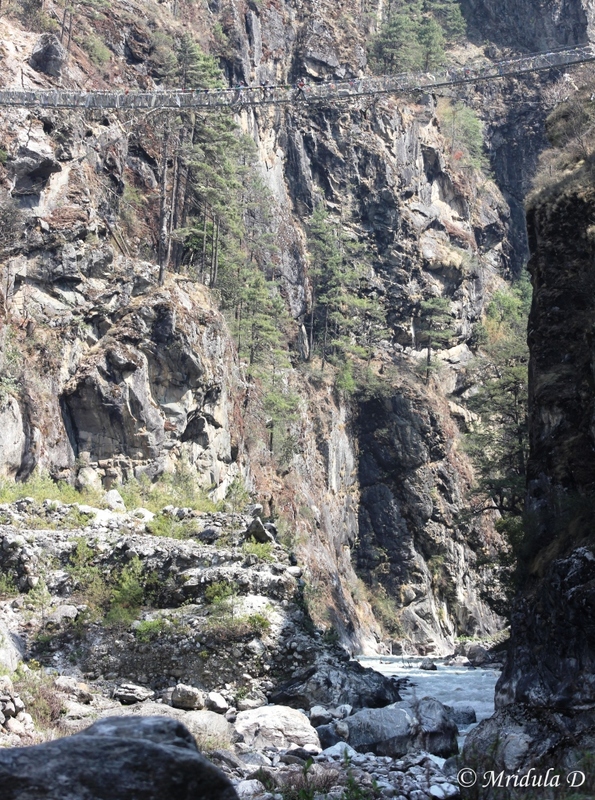 I am told that April is the main season for trekking to the Everest Base Camp and it can get really crowded then on the suspension bridges as well as the lodges. Talking of suspension bridges at the either end there used to be a notice saying if you spot anything amiss with the bridge please call this number. The notice was in Nepali language but it would create a small flutter in my stomach. I am not really scared of heights but even then when I would reach the middle of the bridge sometimes I would feel it a bit. And talking of lodges I was told one can trek in May without pre-booking the lodges as there was less traffic but in April this might mean walking up to the next village to get a lodge! 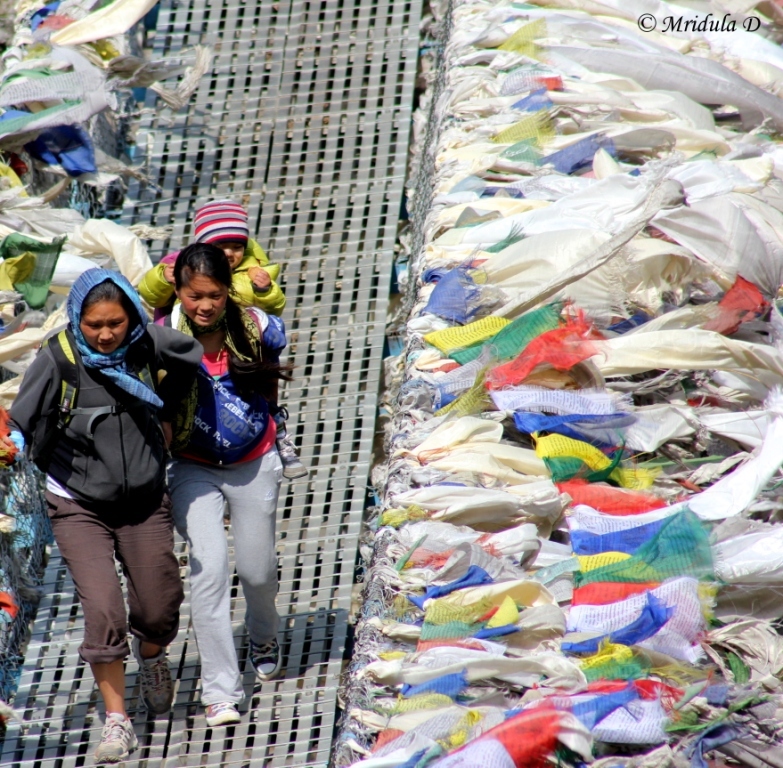 Soon we had climbed down to the bridge with the prayer flags. On this day I was using my 70-300 zoom throughout the day. So I clicked these lovely ladies crossing the bridge from a distance. 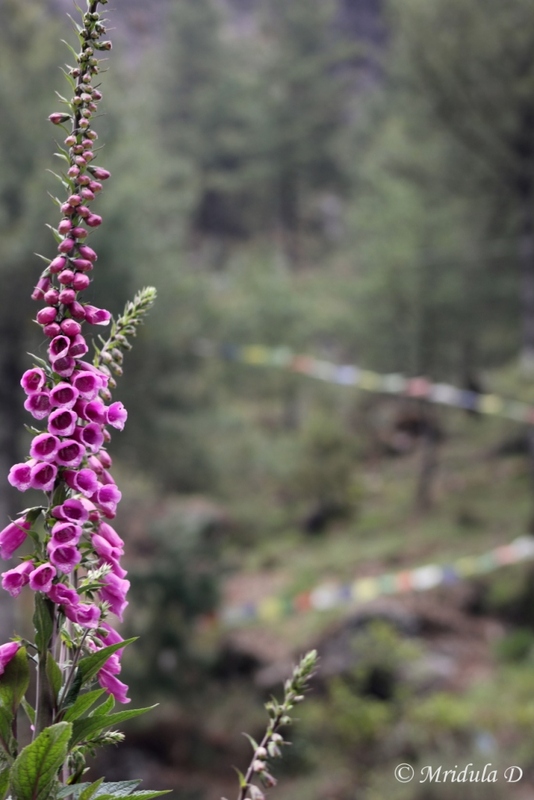 I was quite cheerful up to now and it felt like Namche to Lukla was doable without falling apart. How wrong I was! Still I was walking cheerfully with some music playing in my head constantly. 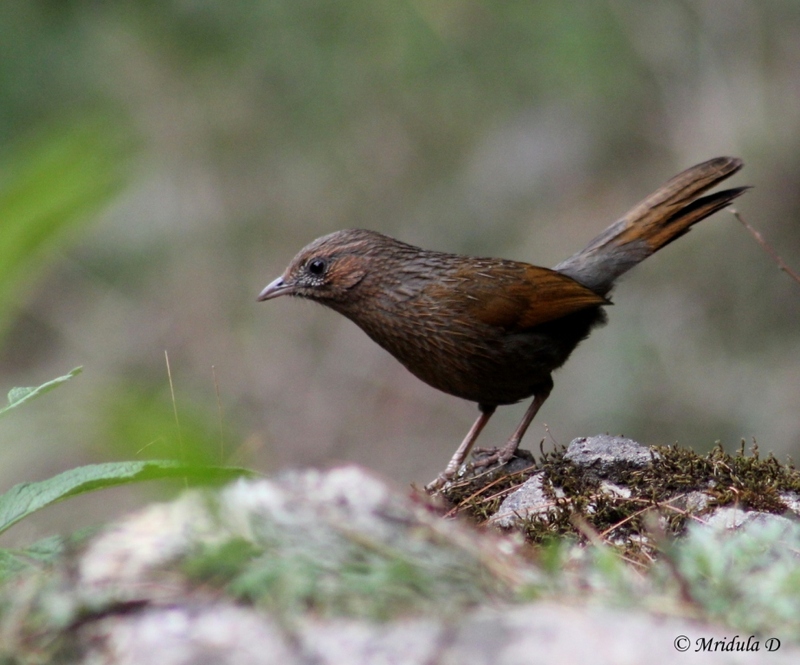 There were a lot of birds chirping along the route and this streaked laughingthrush had no fear for me or my camera. 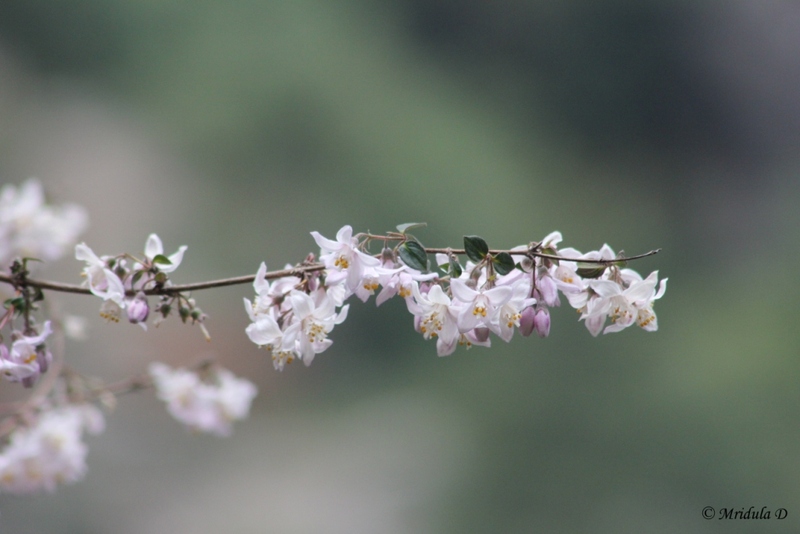 Then there were a lot more flowers too but the mighty peaks had vanished from the sight. We soon reached another check post after which Deepak gave me my trekking permit saying, “Keep it as a souvenir.” And I have done so. I met other people on the way who had trekked along the same dates and they asked how much my 70-300mm weighed? I told them it was 2 kg hence I didn’t use it much on the way. 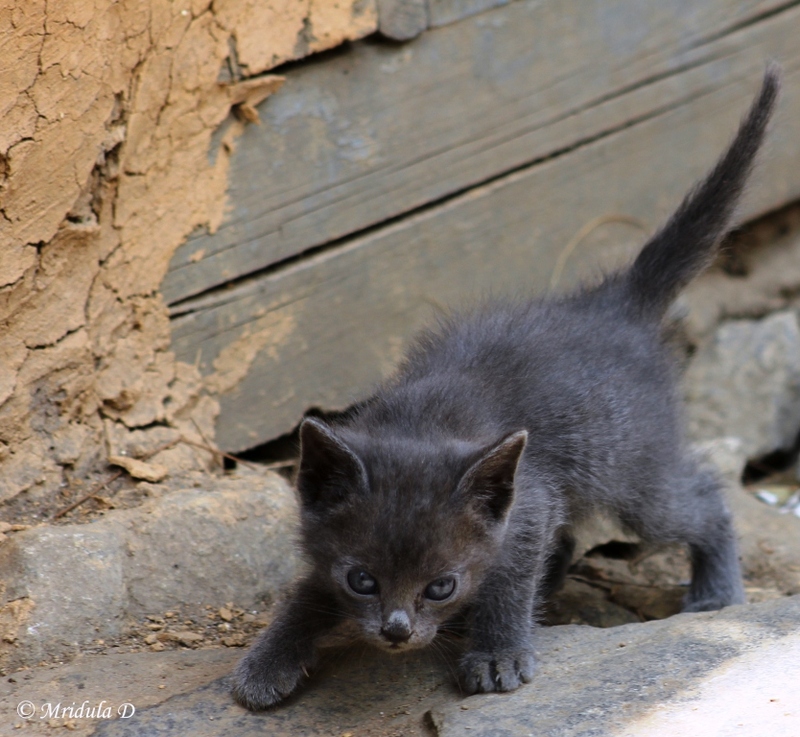 We walked together for a while and saw this kitten and we had to click. I kept walking thinking we would eat lunch at Phakding but after a while Deepak suggested we should stop for lunch before Phakding and I was surely hungry. So we stopped at a lodge and I was the only customer in the dining room. I asked for Daal Bhaat (rice and curry) again with a fried egg. It was very peaceful inside and I was quite startled to suddenly hear a child crying. I didn’t notice the crib till the child cried! It was a 3 month old baby belonging to the daughter of the lodge owner and he got pacified very soon. My meal also arrived quickly and after a tea it was time to walk again. The path was still full of flowers and I was happy clicking them. 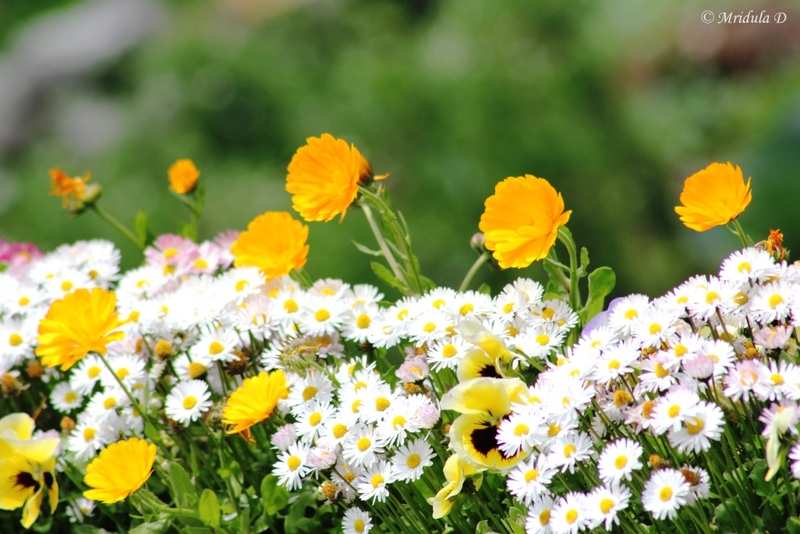 I am quite partial to flowers actually. So when I saw this riot of colors in front of the lodge I had to click again. By 4.00 pm we reached another place where we decided to sit down for tea. We had already crossed Phakding. From there Deepak started pointing out the route to Lukla to me and I told him, “The way you explain it sounds like 3 hours away!” And he didn’t say much and that was ominous. By now I was tired. My knees would protest whenever I tried to get up after a break. 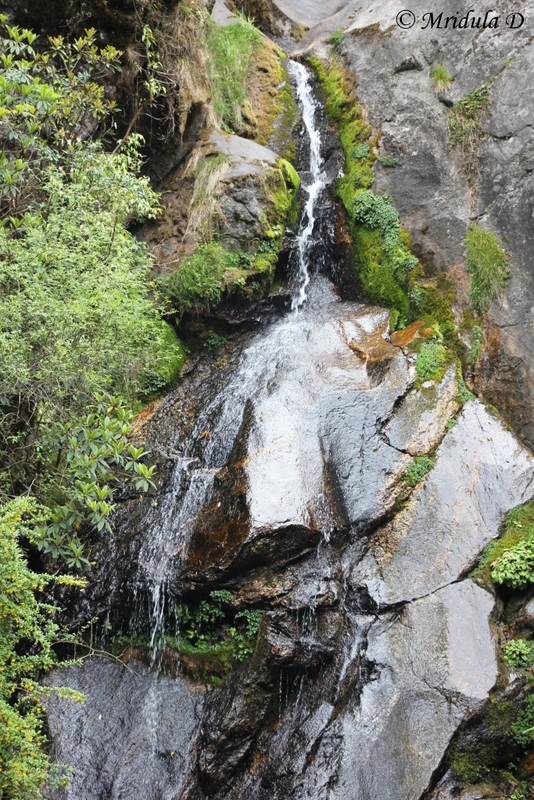 There were still waterfalls and prayer flags on the way but I was reaching for my camera less and less. By now whatever was downhill was giving me pain. I was still fine with a bit of uphill as my knees would behave then. There was a particular bird call that I was hearing since morning and by evening it had started to irritate me. But then there would be something on the way that would cheer me up temporarily. The surprising part was that even though I had walked this route while going up, I remembered very little of it. So I did not had a clue how far I was from Lukla. 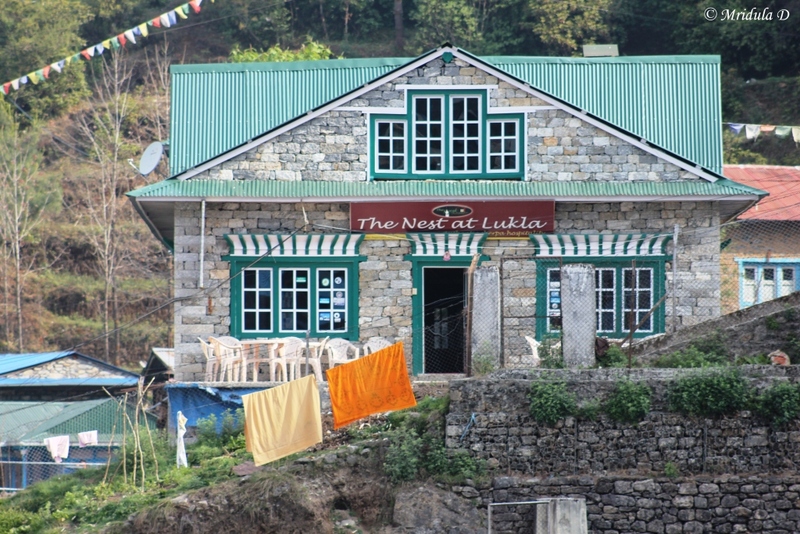 Then Deepak reminded me of the gate devoted to the first Nepali women Everest Climber, Pasan Lamu Sherpa and I eagerly started waiting for it as that was the entrance to Lukla. 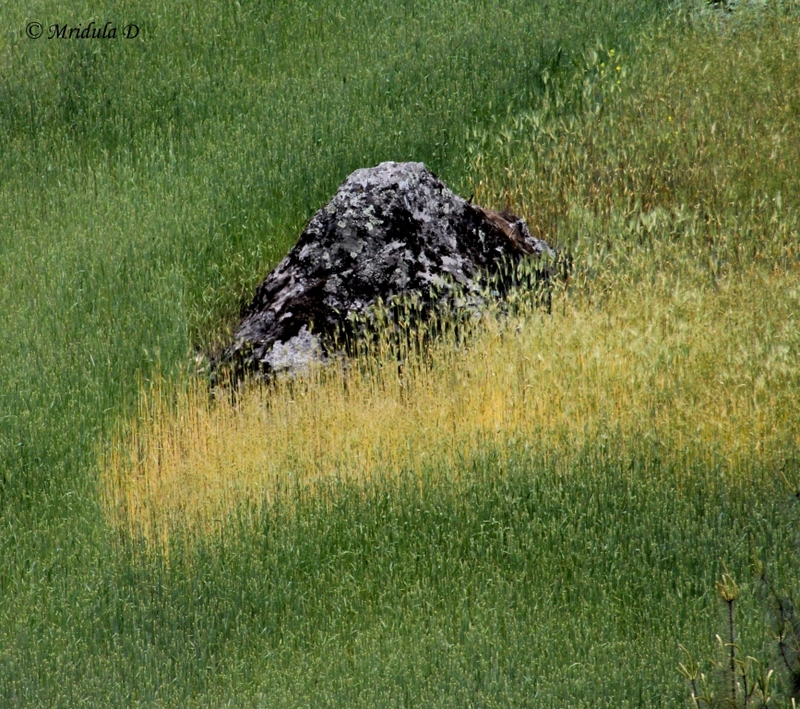 Somewhere I saw a bit of color in a field and I clicked another picture. Finally in the late evening I stumbled through the Pasang Lamu Sherpa gate once again thoroughly tired and exhausted. Then we walked through the narrow roads of the main market to reach our lodge, the Nest which is right next to the airport. Trust Deepak to choose the lodge which was the last one on the route till the end! It was past 6.00 pm when I finally stumbled through the gates of the Nest and it had been another 11 hour day. But then it was over. I only had to stumble up to the airport the next day to catch the Lukla flight, if it took off! However much I love mountains I was longing for some clean clothes, hot water shower (it was available in Lukla too but not the clean clothes, all my clothes were dirty by now) and cakes. Hence I wanted good weather so that the Lukla flight would take off. I had tea and apple pie and then mushroom soup and bread for dinner. The room at the lodge was big and clean and it had an attached bathroom. It was enough for the night. The cakes and the shower could wait for one more day.